The first topical lip filler that uses plant Stem Cells and Hyaluronic Acid for the treatment of the delicate lip contour area. This exclusive combination of ingredients provides wrinkle-filling effect. The area around the lips is particularly dry and delicate because it is devoid of sebaceous glands. With the passage of time, expression wrinkles appear in this area due to repetitive mouth movements. Stem Cell NanoFiller™ Lip Contour is the first filler based on plant stem cells and hyaluronic acid designed specifically for the treatment of the delicate area around the lips. This unique combination acts synergistically and gives a double effect: restructure and fill. The hyaluronic acid fills the finer areas, providing support to the cells created. 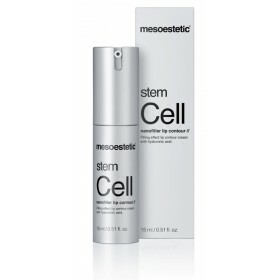 A bottle of Stem Cell NanoFiller™ Lip Contour for home maintenance leads to results obtained in the beauty salon. Regenerator: The plant stem cell extract stimulates collagen and elastin production, prolonging cell life. Filler: hyaluronic acid fills the thinner areas, providing support to the cells created. Apply morning and night in the lip contour by means of gently touching with the fingertips until it is fully absorbed.